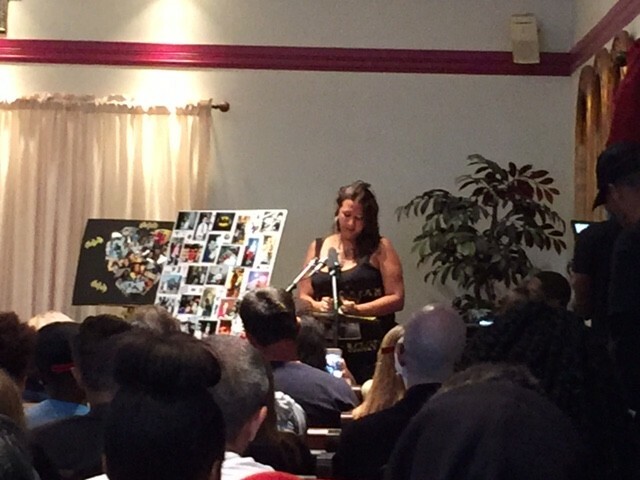 Gina Torres speaks at the funeral of her son, Isaiah Hammett. Four months ago, Isaiah Hammett was killed by St. Louis police officers, who'd stormed his family's south city home in a SWAT raid. Today, his family finally laid him to rest, saying the 21-year-old was a hero. They believe he saved the life of his disabled grandfather, Daniel Torres, who was also in the house during the raid. Torres, they say, avoided being shot only because his grandson came to his bed even after being mortally wounded and pulled him to the floor. "I know my son's a hero," said Hammett's mother, Gina Torres. "I just wish I didn't have to lose him so soon." The family was joined by a large contingent of the protesters who have taken to the streets in the city in recent weeks. The more than 300 mourners who filed the McClendon Mortuary in north county included state Representative Bruce Franks (D-St. Louis), Pastor Cori Bush and the Reverend Darryl Gray, who all gave remarks tying Hammett's death to the larger movement. 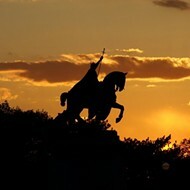 The speakers noted that Gina Torres has become a regular presence at the protests, which were catalyzed by the September 15 acquittal of former St. Louis officer Jason Stockley, who was charged with first-degree murder after shooting a drug suspect named Anthony Lamar Smith. Even as the protesters have focused on the idea that Black Lives Matter, they have found common ground with a family left reeling from a police shooting, even though the young man shot was not himself black. "Ever since this tragedy happened and we took to the streets, Isaiah's mother and brother took to the streets with us," Franks says. "We see Isaiah was loved. And he will always be our brother." 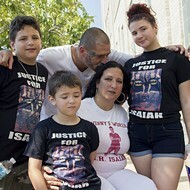 To Torres, Franks vowed, "We are going to fight for you and fight for justice for Isaiah." Said Bush, "We need more folks to pay attention to this. If we stay in their faces, this can't continue to happen. We allowed it to happen because we were complacent. But no more. Every person in this room is challenged to make sure it won't happen again." Isaiah Hammett, left, with his mother Gina Torres and dear friend Julian Cobb. 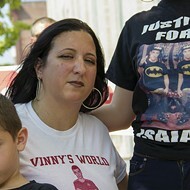 Many mourners wore buttons saying "Justice for Isaiah Hammett" or T-shirts bearing his name and face. The speakers alternated between messages seeking justice and fond remembrances of the young man they knew, including a statement from Hammett's father, read aloud by his uncle Jeremiah Hammett. His father remembered Isaiah as a Boy Scout winning the boxcar derby and delighting in video games. "I can't think of a better way to go out than by taking care of your family," Jeremiah Hammett said in his own remarks. "And that's what he was doing." Police have said that they were executing a search warrant on the family's home because they suspected Hammett was selling guns and drugs. 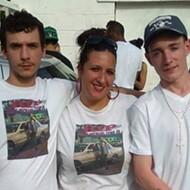 But the family has said any guns in the home were legal — and note that even the police have said only that they found a "quantity of marijuana" after the deadly raid, with an amount they have never specified. They say that, despite police claims that Hammett had surveillance cameras and surely saw them coming, the cameras hadn't worked in years. And while the police department claims Hammett fired on them, the family says their investigation has shown the only bullet holes came from outside the house. They've posted a note about the case on Facebook seeking to set the record straight. 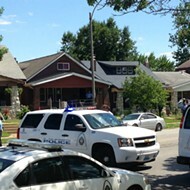 The sole survivor of the raid targeting Hammett's home, his grandfather, was not there for today's service. "My dad couldn't even be here today because it was too hard for him to say goodbye," Gina Torres said through tears.